Mt. Hood, OR – Slightly over 49 years ago, Mt. 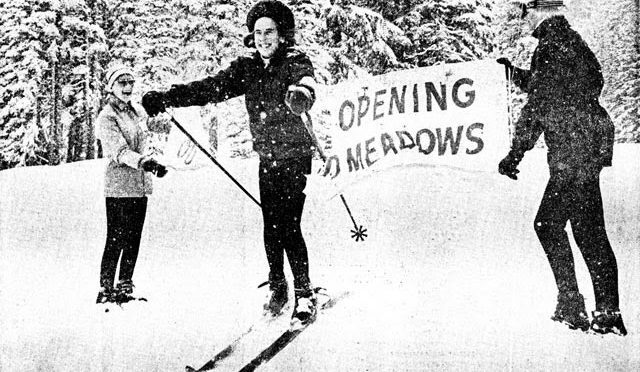 Hood Meadows officially opened on January 26, 1968 with ceremonies attended by over 200 dignitaries including America’s only Olympic gold medalist Gretchen Fraser. The ski area launched with two lifts, a T-bar and a rope tow. Fraser’s inaugural run was the full 1,061 vertical drop from the top of the Blue lift, ending at the base area lodge, skiing through the grand opening ribbon. 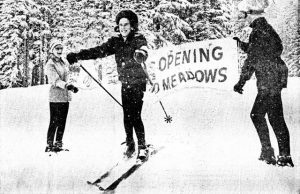 And while the run took only a few minutes, it was the culmination of an initiative that began more than two years earlier when Portland businessman Franklin G. Drake saw the U.S. Forest Service announcement requesting proposals to build a new ski area on Mt. Hood. Now on the verge of its 50th anniversary season, Mt. Hood Meadows has grown to become one of the largest and most popular winter recreation areas in the Northwest. 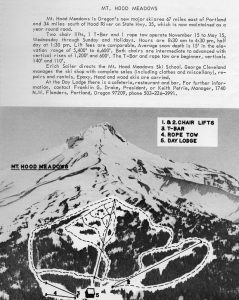 The many expansions and improvements over the years added chairlifts, lodge facilities and infrastructure to accommodate the growing population of the Portland area and demand for snow sports on Mt. Hood. A website has been launched to detail the history, list events and activities, and promote 50th anniversary deals and special offers. A Facebook Group has been established to collect and share personal stories and reflections of guests and team members. “The story of Meadows really is the collective personal experiences of those who have visited, recreated and worked here over the years. We are looking forward to sharing that story over the next 16 months as we celebrate our 50th anniversary season,” says Tragethon.